Unfortunately we’re not travelling at the moment – saving up for the next big trip! Our past trips are mapped out below. Blue trace – Trans-Australia Trek, March 2014 – May 2014, 15,000km. Start following the trip here. 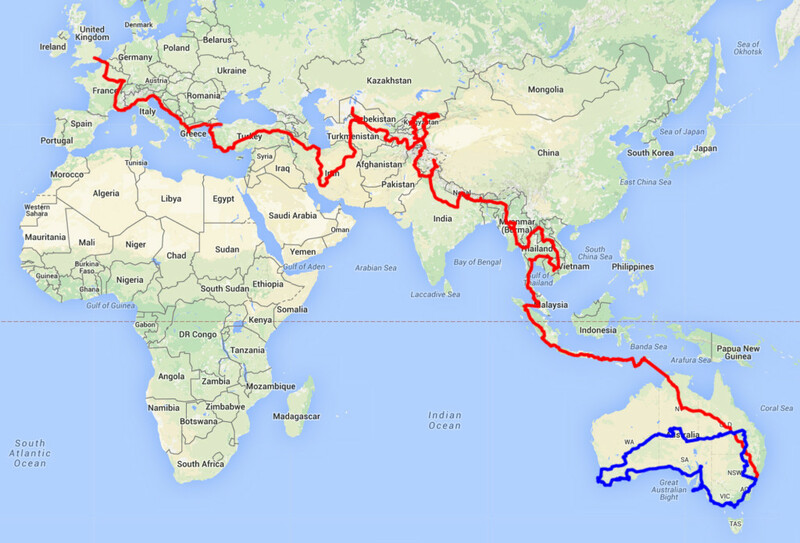 Red trace – Sydney to London, March 2015 – January 2016, 45,000km. We have only just joined your trip and are amazed at how far you have travelled already. We look forward to following you online and enjoying your adventure as it unfolds. Safe riding and best wishes. you got any plans of going into Myanmar , much interested. And how are the DR,s going? not a common bike over there but tire location shouldn’t be to hard. Hooray! You are finally in China!! Now you are finally on the Med, is it any warmer? Hope so – love to you both.